ZZ Top is an American icon. The blues-rock trio from Texas specialized in down-and-dirty blues-rock during the ’70s, then scored colorful MTV hits during the 1980s. 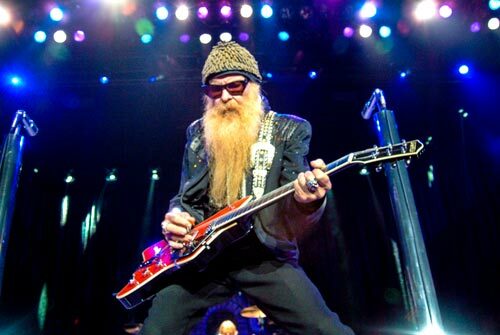 Formed in Houston in 1970 by Billy Gibbons (guitar), Dusty Hill (bass), and Frank Beard (drums), the trio still releases hit albums and continues to fill arenas and stadiums around the world four decades later. Currently crossing the country on The Tonnage Tour, ZZ Top will be making a stop at the Washington County Fair Complex, 873 NE 34th Avenue in Hillsboro on Saturday, July 28 at 8:00 pm. Tickets are available through Bigfairfun.com for $45.00 general admission and $65.00 reserved seating. #1 is $400.00 per person and includes reserved seating in rows 1-5, a meet & greet with the band, a personal photograph with the band, $50.00 merchandise voucher for their online store, a copy of their new “Live” Greatest Hits Around the World album, and a commemorative meet & greet laminate. #2 is $275.00 per person and includes reserved seating in rows 6-15. $40.00 merchandise voucher for their online store, a copy of their new “Live” Greatest Hits Around the World album, and a commemorative tour laminate.